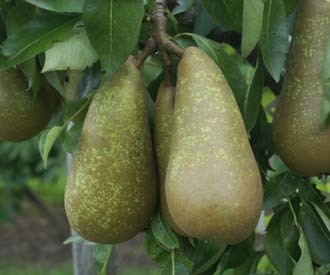 A sweet perfumed mid season dessert pear. Raised at the John Innes Horticultural Institute, Merton, London, UK 1933. Medium sized, conical to pyriform fruit. Greenish yellow skin with patches of brown russet, Smooth, juicy, creamy white flesh. Good flavour.